When we last left Chip Baskets, Bakersfield’s own “professional” clown, his life was in shambles, at least more than usual. He’s forced to take a job at Arby’s after the rodeo that took him in closed down. His friend Martha started sleeping with his smug brother Dale. His wife Penelope, a woman who has openly and avidly expressed her disinterest towards Chip, tells him to forget her. Everything that remotely resembled a life for Chip has almost completely eroded. So what does he do? He jumps on a train headed somewhere in the hopes of finding a new life, or at least a slightly different one. Welcome to the second season of Baskets. Written and directed by Jonathan Krisel, “Freaks” places us in Chip’s new reality as a hobo on the run from his past self. Two weeks after leaving Bakersfield, te’s sleeping in train cars, paying for cans of food with chump change, and generally living as a directionless destitute. In the first act of the episode, Krisel frames Chip’s situation as lonely and dire—avoiding patrolmen and dogs, fishing change out of the crevices in his shoes, etc. 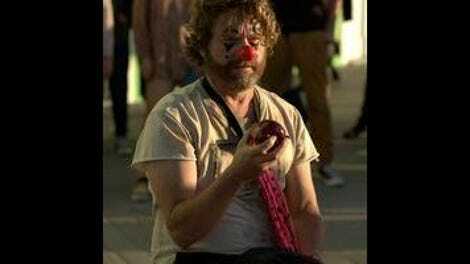 Meanwhile, Galifianakis mines Three Stooges-esque slapstick comedy out of the situation, e.g. the scene when he repeatedly tries and fails to open his one can of food without a can opener, trying everything from banging it on train tracks to throwing it at a sign. But soon Chip’s situation, and Krisel’s framing of it, changes when he meets a nomadic gang of “freaks” who live on the margins of society. After being kicked off a train car, Chip is saved by a young woman named Trinity (Mary Wiseman). She provides him with moderate shelter and comfort underneath an underpass and introduces him to the flock of street performers led by the charismatic Morpheus (Tobias Jelinek). (As you could likely surmise, the whole flock is named after Matrix characters.) Chip almost immediately requests to join the gang, knowing intuitively that he requires a family to survive. They embrace him with open arms once they learn he’s a clown. “Welcome home,” says Morpheus as they trudge up a hill with the sun in their eyes. Of course, things take a nasty left turn very quickly, partially because of Chip’s stage-hogging arrogance and also because Morpheus and the crew aren’t who they seem to be. At their first street show, Trinity, also a clown, tells Chip to follow her lead, but Chip doesn’t listen and proceeds to claim the stage himself. His shameless pandering becomes a hit with crowds and brings in quite a bit of money for the group, but his behavior and success makes Trinity feel alienated from everyone. When it comes time to decide what to do with the money, Morpheus lets Chip decide whether to spend their money on a tarp or snacks. Trinity tries to persuade the group to get a tarp since it’s going to rain, but Chip wants snacks, leading to her leaving their “family” in a huff. “You don’t know these people,” she tells Chip before departing. She’s obviously right, but Chip learns who they really are later that evening when the group breaks into a suburban home for shelter to escape the rain. Though visibly uneasy with their crime, Chip becomes even more uncomfortable when he discovers that “snacks” doesn’t mean food, but instead heroin and prescription pills. Soon everyone is smacked out of their heads and Chip realizes that his sweet family have darker impulses. It’s like every other family that Chip joins: He’s suckered in with the promise of inclusivity and community but becomes turned off when he finds out that the sunny exterior isn’t the true article. “Freaks” isn’t a great episode of Baskets, but it succeeds by reintroducing the show’s tone—equal parts melancholic and broadly comedic. Galifianakis and co-creator Krisel and Louis C.K. share an absurdist sense of humor, which pokes its head out in various ways, mostly through Chip’s naiveté regarding his surroundings. Yet, they also all share a grounded sense of dramatic reality with regards to the series’ exploration of delusion and fear. Chip is a man so committed to his dream of being a clown that he’s dropped out of traditional society, abandoned his real family, and joined a gang of drug addicts. But if there’s any change in Chip’s behavior from last season, it’s that his hardships have humbled him. He tries to make peace with Trinity when she expresses her discontent and later expresses regret when she leaves the group. He feels remorse when he sees family pictures in the suburban home. He declines to do drugs. These aren’t necessarily hallmarks of a “good person” necessarily, but they’re a far cry from Chip’s ugly brand of narcissism. He’s evolving, even if it’s in fits and starts. In the world of Baskets, that small amount of personal growth is necessary to stand tall above the chaos of disappointment and failure that lies below. Welcome to the return of Baskets coverage. Hope everyone has fun in the coming weeks. Dale, Martha, and Christine makes brief appearances this week. Christine is making a family wall filled with pictures while Martha wants to put up Lost signs to help find Chip. Though Christine makes a big show about not wanting to give Chip any undue attention, she ends up looking for him in the rain by the end of the episode. Funniest sight gag: When Chip lights his ponytail on fire with a cigarette. Tobias Jelinek is a dead ringer for Walton Goggins. Chip is briefly confused if Morpheus is injecting heroin into his arm or an EpiPen. When he sees him fall back in ecstasy, he realizes immediately that it’s not an EpiPen.